As a man, you like to wear jewelry, but it has to be boldly masculine in appearance. A gold chain demonstrates your attention to luxury, but it can be expensive, and it is not necessarily distinctly masculine. Also, it can react with your skin and can tarnish. Increasingly, men’s titanium chains are the choice for adorning the neck with a shiny, strong and inexpensive metal. There are a number of reasons that men are choosing titanium chains. Men’s titanium chains retain their beautiful appearance for many years. Because titanium does not tarnish and is much harder than gold or silver, it will remain shiny and will not sustain dents. You can own yours for decades without seeing any change in its look. Also, it will not break so you need not worry if it snags on clothing or on an object. Finally, you can wear your chain in a chlorinated pool, in the shower, or in the ocean without enduring damage or discoloration. Comfort. Because titanium is hypoallergenic, it will not cause a rash, discoloration, or discomfort with the skin. This is important because the chain will touch potentially sensitive parts of a man’s neck and chest. Also, a titanium chain is very lightweight so you can easily forget about it. Finally, men enjoy these chains because they do not pull at the hairs on their chest. Masculinity. The gunmetal, gray color and the hardness of the metal, combined with its non-traditional use for jewelry, provide a masculine feeling that is not obtainable with softer, more conventional metals, such as silver and gold. Titanium chains are the choice of professional baseball players, who value them for their mythical ability to improve athletic ability and speed healing. Price. If you try to buy a 20-inch-long, 14K gold, 2mm chain, you will pay at least $130. 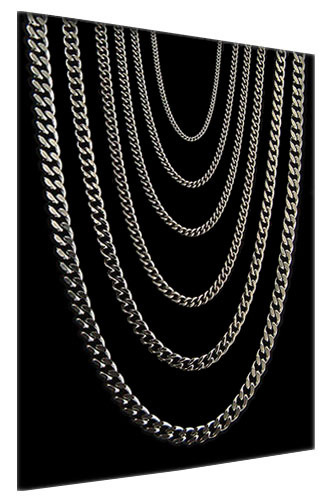 Men’s titanium chains in the above dimensions will cost about $70. In addition, they carry the benefits of not irritating your skin and remaining blemish-free for years. If you are a Gen Y man, who wants to make a statement, but needs to watch his dollars, a titanium chain could be the right choice. A titanium chain is the choice of many men who want to adorn their necks with a masculine, strong, and comfortable piece of jewelry. If you are a woman who finds men’s titanium chains to be attractive, you may want to purchase one for your husband or boyfriend.